The Port of Stavanger administers cruise, goods, offshore and ferry traffic. Other important activities include property management, pleasure boat tourism and collaboration with festival organisers and public sector bodies. You will be welcomed by service-minded and innovative professionals. The Stavanger region offers a well-developed infrastructure and people with high levels of skills and expertise. We are centrally located in relation to the rest of Europe. As a company, the Port of Stavanger Group aims to be northern Europe’s most professional, convenient and attractive port. You can read more about how we are working towards achieving this vision in our Strategic Plan for the Port of Stavanger Group (2015-2017) (pdf, in Norwegian). The ports in the Stavanger region aim to offer efficient, competitive and environmentally sustainable services. The Port of Stavanger aims to be proactive in port facility development, and a driving force for the continued expansion of ports and maritime infrastructure in the region. Through its subsidiaries and participating companies, the Group aims to operate and provide services at the port terminals under its ownership and management. The Group shall also carry out mandatory activities on behalf of the owner municipalities. The company’s owners operate with a long-term perspective in relation to their corporate investments and the development of the Group. The inter-municipal port authority was established on 15 March 2000. From 1 January 2007 a restructuring resulted in management and operations being allocated between two new companies. The parent company (Stavangerregionen Havn IKS) deals with administrative activities linked to the port, and also acts as owner of the Group’s mooring facilities and properties, which are leased out to the wholly-owned subsidiary Stavangerregionen Havnedrift AS. The parent company was established pursuant to the Norwegian Act relating to Inter-Municipal Companies, no. 6, of 29 January 1999. A separate corporate agreement has been drawn up and the company is registered in the Brønnøysund Register Centre. Stavangerregionen Havn IKS has been the main owner of Risavika Havn AS since 2004. Now is the time for the next step. In order to further develop Risavika, the Stavangerregionen Havn IKS has now initiated a process for acquiring ownership of the company by the end of 2019. The future will be to further develop the remaining area with complementary port-related activity to secure its position as the western Norway’s logistics hub. 200 acres will be developed for logistics, combination- and office buildings. 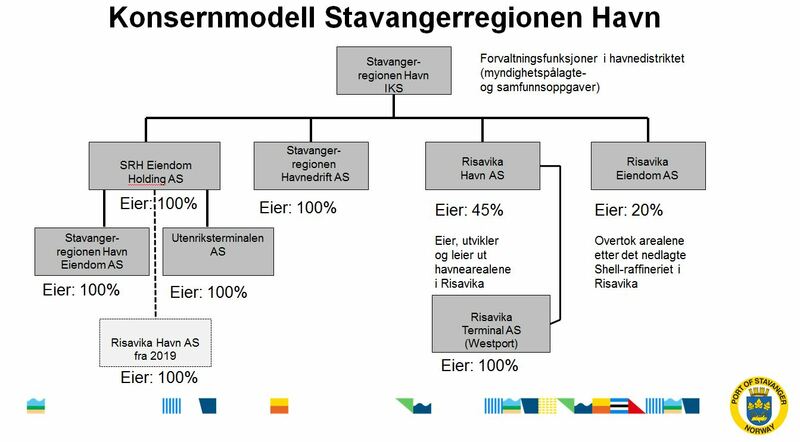 The company Stavangerregionen Havn IKS is owned jointly by the municipalities of Stavanger (80.69%), Sola (16.75%), Randaberg (1.36%) and Rennesøy (1.19%). The shareholders’ committee is the company’s highest authority and is comprised of five members appointed by the owner municipalities. Jarle Bø (from Rennesøy municipality) chairs the shareholders’ committee for the period 2016 – 2020. The Board comprises seven members who are elected by the shareholders’ committee. Christine Sagen Helgø from Stavanger municipality is Board Chair for the period 2016 – 2020.